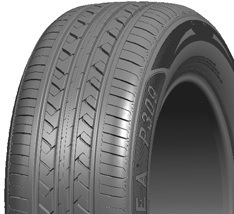 Four wide longitudinal drainage grooves effectively prevent the lateral hydroplaning. Small diagonal grooves in the center of the tire tread ensure good straight driving stability as well as improve accelerating performance. Special-designed steel sheet in pattern blocks of tire shoulder provides effective low heat generation and reduce resonance while driving.